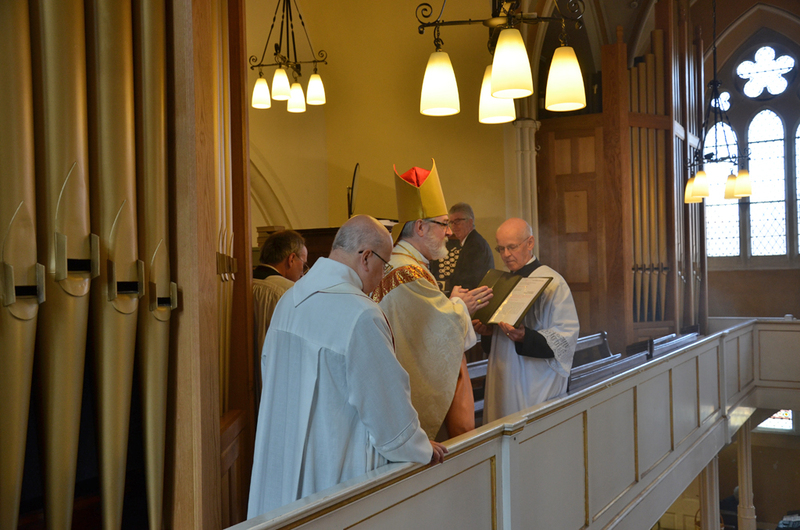 The morning of 1 May 2016 was a joyous time in St Mary and St Giles Church. We welcomed Bishop Jonathan Goodall to celebrate mass, bless the organ and licence Fr Tunji as an Associate Minister in our parish. 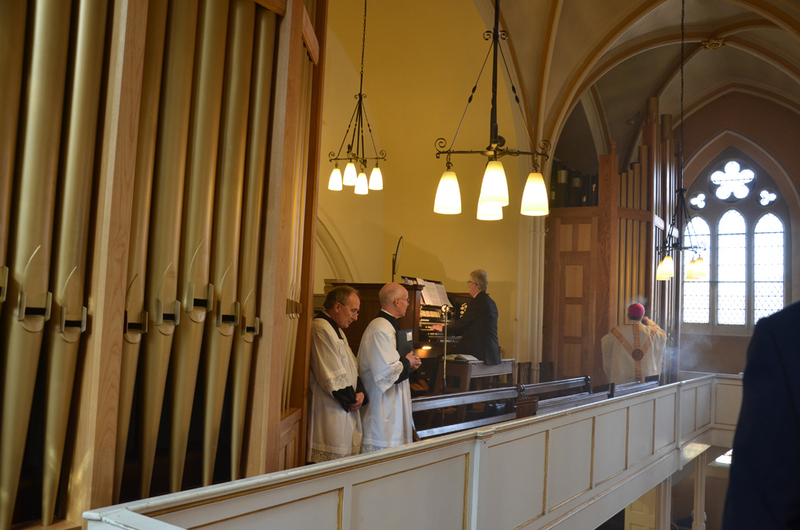 "My dear brothers and sisters, we have come together to bless this organ, restored so that the celebration of the liturgy may become more beautiful and solemn. 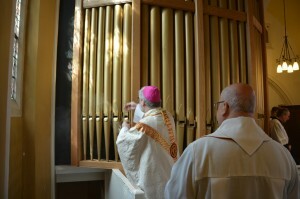 The purpose of music in the liturgy is above all to give glory to God and to lead us to holiness. Thus the music of the organ wonderfully expresses the new song that Scripture tells us to sing to the Lord. To sing this new song is to live rightly, to follow God's will eagerly and gladly, and by loving one another, to carry out the new commandment that Jesus gave us. Lord God, your beauty is ancient yet ever new, your wisdom guides the world in right order, and your goodness gives the world its variety and splendour. The choirs of angels join together to offer their praise by obeying your commands. The galaxies sing your praises by the pattern of their movement that follows your laws. The voices of the redeemed join in a chorus of praise to your holiness as they sing to you in mind an heart. 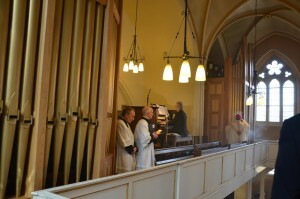 We your people joyously gathered in this church, wish to join our voices to the universal hymn of praise, so that our song may rise more worthily to your majesty, we present this organ for your blessing: grant that its music may lead us to express our prayer and praise in melodies that are pleasing to you. We ask this through Christ our Lord. Amen"
Bishop Jonathan then incensed the organ while John Neal played it with a triumphal start to the introit hymn. 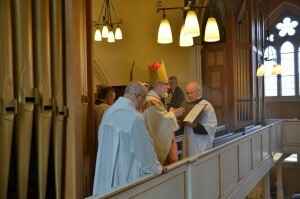 The Parish Singers sang the psalm 67 'Let the People's praise you, O God' with Jacob Collins accompanying on the organ. Lesley Salter conducted us. 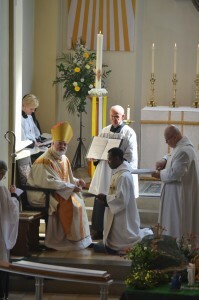 Later Bishop Jonathan performed the ceremony to licence Fr Adetunji Adebiyi as Associate Minister in our Parish. He did this on behalf of the new Bishop of Oxford, who has only just been appointed and is not yet in post. 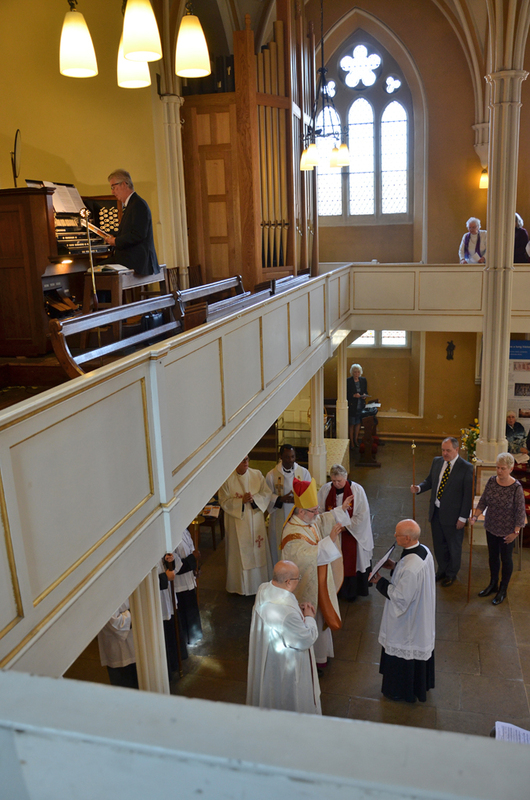 It was rather wonderful that it was a gloriously sunny day and the shafts of sunlight lit up the sanctuary and the Easter garden as Fr Tunji gave his oath of canonical obedience to God. 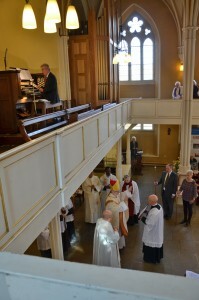 During communion the Parish Singers sang an anthem called 'Born to Sing' (music by Brian Hoare, arranged for choir and organ by Roger Mayor) with Kath Hindley conducting and Jacob playing the organ. 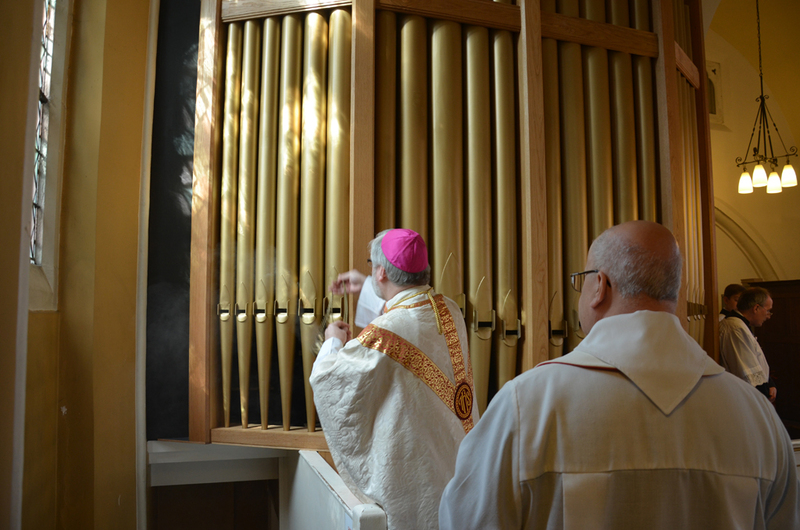 Fr Ross read out two pipe dedications in memory of Fr Cecil Hutchings (vicar of St Giles) and Derek Savage (organist) who had been instrumental in bringing the Willis pipe organ to Stony Stratford in 1967. These are on display in the church with the organ noticeboard. 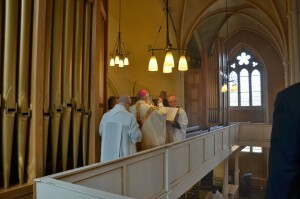 Months previously Fr Ross Northing had chosen the hymns, when he came to put the service sheet together he looked up the origin of the recessional hymn and discovered that the hymn text for 'Angel voices, ever singing', published in 1861, was written by Francis Pott to celebrate the blessing of a new pipe organ at the Church of St John the Evangelist at Wingate, Lancashire. The tune was also 'Angel voices' by E. G Monk. So it was the perfect hymn to use at the end of this happy celebration. After mass we had a Bucks Fizz and Cake reception during which Bishop Jonathan approached me for a chat about the success of 10 years of fundraising to restore the organ - he is an enthusiastic musician and is warmly supportive of what we have all done. Later in the day I was painfully reminded of an episode in the Willis organ's history. Just after 3pm a disastrous fire hit Stony Stratford again, this time bringing down a Grade II listed building, affectionately known as Haseldines because for many years it was the home of the bakery run by the Haseldine family. The fire also brought down the building housing Cowleys funeral directors and seriously damaged Stratford Arcade. As we all watched the 1 May 2016 fire in horror I remembered one sunny Sunday in 1995 when after the mass we brought the entire pedal violone rank of pipes (metal pipes) out of the organ, lowered them down the gallery passing them to parishioners waiting below and carried them up the high street to Haseldines bakery for storage. Instead of entering the bakery on the left or the shop on the right, we entered the family home front door, walked along the long passage between the two shops, past the stairs to the house above (on our right) and out into the backyard, then to the left to a brick shed where the pipes were stored. The reason this 1995 pipe removal and storage occurred was the latest batch of church restoration - the wall above the church kitchen was crumbling and had to be rebuilt but the pipes were against that wall on the inside and could not be stored in the church as Fr Cavell Cavell-Northam wanted to keep the gallery open. So while the wall rebuilding took place Haseldines stored the Violone pipes for the parish as John and Eileen Haseldine were regular worshipers at St Mary and St Giles. John Page supervised the pipe removal and return, to ensure that they were not damaged (some were large and unwieldy) and the whole operation was carried out without a hitch. Now, 21 years later, the sight of Haseldines going up in smoke was heartbreaking for so many reasons. The whole community of Stony Stratford is shocked and very sad. Several businesses and a family who were living in that building have been displaced by the fire. We have such a strong, friendly community and it is heartening to read how people are helping each other in such a stressful situation (the barber shop in the arcade set up 3 days later in a vacant shop). My prayers and best wishes to all those who are having to rebuild their businesses and lives as a result of this devastating fire.